The Federal Trade Commission announced today they have reason to believe T-Mobile USA has been charging customers for "premium" texting services which they never subscribed to, and were never authorized by the customers. The Federal Trade Commission announced today they have reason to believe T-Mobile USA has been charging customers for "premium" texting services which they never subscribed to, and were never authorized by the customers. The FTC believes T-Mobile has charged hundreds of millions of dollars in the form of these SMS subscriptions. The texting subscriptions were for things like horoscopes, celebrity gossip, and dating advice, typically for the cost of $9.99 per month. 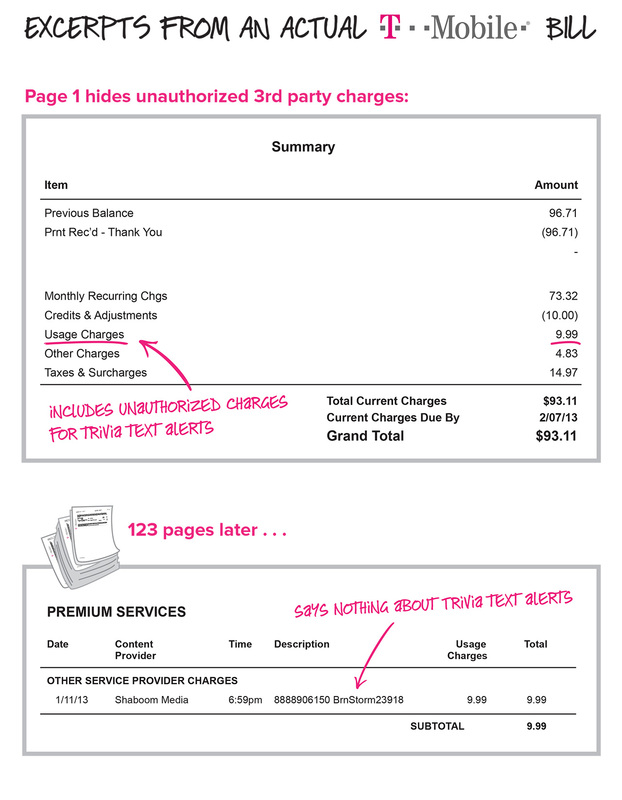 If a customer complained, T- Mobile would in some cases continue to bill customers, even knowing these were scams. The FTC believes T-Mobile took about a third of the amount paid by customers into their own pocket. On a press call, FTC Consumer Protection Director Jessica Rich said T-Mobile blatantly ignored fraud by doing this. "We allege that T Mobile knew about these fraudulent charges and failed to stop them or take any action and therefore they continued. In terms of criminal charges, I cannot comment on that, it is not public." This process is known as "third-party billing," and when the charges appear without the customer's authorization, it is called "cramming." The FTC has long been waging war on cramming, although mobile cramming is a more recent development. This is their fifth mobile cramming enforcement action. The lawsuit specifically seeks a remedy to the refunds. The FTC determined that T-Mobile not only refused refunds, but many of those who did receive refunds only received a fraction of the cost. Some customers received two months worth of refunds on multiple months worth of charges. In some cases, T-Mobile told customers to seek refunds directly from the third-party SMS services, however, they did not provide proper contacts to these services. During a press call on Tuesday, the FTC said they were not able to reach a settlement with T-Mobile. They are not yet able to determine a specific amount they will be seeking, but hundreds of millions of dollars are at stake and the FTC will seek the full amount in court. The FTC plans to get customers all their money back, at which time notices will be sent to consumers if the court rules in their favor. Additionally, the FCC has launched an investigation, which could result in a major fine to T-Mobile. Additionally, the FTC will seek to permanently prevent T-Mobile from engaging in any future cramming. As for the number of customers affected, the FTC did not have an exact number, but they did say that they received "oodles of complaints." We believe "oodles" to mean millions of customers were affected. This may also affect other telecommunications firms. The FTC has urged others to review how they operate. Michael Karcic, a senior sales executive at a large telecommunications firm familiar with the matter, told The Wire, "I think this is going to create a domino effect. If you look at any cell phone bill, they are not all that clear. I'm not surprised they got caught and I do expect others to come down with them."